Probably my oldest and most-wanted feature-request for Google Earth has been to show NASA's beautiful Blue Marble images for the Earth when zoomed out. Several months ago I actually went to the trouble of figuring out a way to do it using network links which would be elegant to use. I asked Barry Hunter, who has implemented lots of interesting "add-ons" for Google Earth at his Nearby web site, to help implement a solution. Unfortunately we ran into a couple of problems at the time and never published it. Plus, I was told by some of the GE team members they would "probably" implement something themselves. So we've been waiting. Well, nothing from Google yet, so now we're releasing a working version of our concept. And, it works even better than we expected! Basically, all you have to do is load this Blue Marble and Clouds network link . It loads up NASA's Blue Marble NG image for November and the current global clouds. When you zoom down to look at the Earth more closely, the clouds and BMNG image fade away. When you zoom back up, they come back. This is the kind of thing Google should implement built-in to GE. And, thanks to the availability of BMNG images for each month of the year, they could show the right image for each month of the year. By the way, you can turn off the clouds or the BMNG image overlay if you want and just use one or the other and it all still works. I like the BMNG image by itself. This was done by using a network link to let a program at Barry's server know what the current altitude of the view is. When you zoom down it adjusts the transparency of the clouds and BMNG images. It actually works very well. But, this is still an experimental program. Hopefully, Google will implement something equivalent or better. 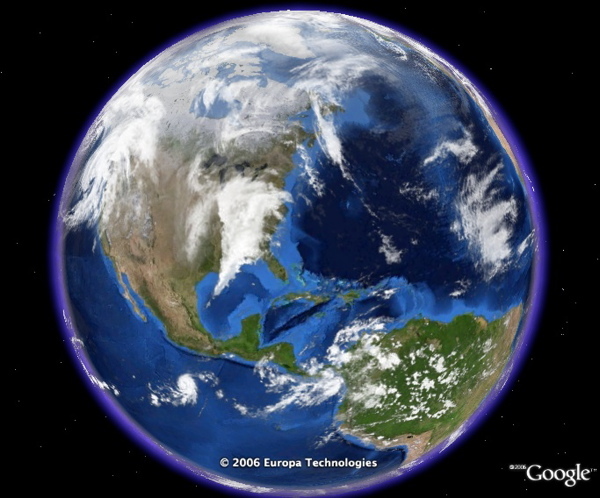 And, by the way, Microsoft's VE 3D and NASA's World Wind both use better global images when zoomed out. Leave a comment here if you think this is something Google should implement. By the way, the global clouds are updated every three hours automatically. You can read about the clouds here. And here's the location of NASA's Blue Marble images. Hell yeah Google should implement this - it is awesome! I was going to suggest something, but I see you've already done it. The cloud layer has an elevation, so if you're viewing from ground level, and tilt to see the horizon and sky, reasonably correct clouds appear overhead. Very cool! Since the resolution of the image you're using isn't very high, I would put the fading zone higher (let say 2500 km instead of 1250 km) and the transition fading altitude region a little longer. Oh I see! and also transparency of the "Blue Marble" layer is reduced as you zoom in! I'm recommending this layer to my friends. - note however this is still experimental so the settings wont persist forever in your 'My Places' - if need-be we intend to have a page to create 'my earth' where you can customise the parameters to your hearts content!